Cyclists will be directed to zebra crossings where they must dismount and walk across if a draft redesign for the Walkinstown Roundabout in Dublin is proceeded with. As the roundabout has six roads off it, it could mean walking across up to three crossings. Even if the law was changed to allow cyclists to cycle on such zebra crossings it is understood that cyclists would have to yield at each — meaning yielding three times or more to make the same movement. As we reported last week, the Department of Transport confirmed that cyclists must dismount before using zebra crossings — even where such crossings are part of designated cycle routes. The current roundabout design in Walkinstown (pictured above, click image to go to Google Maps) is one of the worst for walking and cycling within the M50. It has three general lane entry points, three lanes on the roundabout and lacks safe crossing points — all in the centre of an urban village. The redesign would include reducing the roundabout to two lanes at entry and around the roundabout. 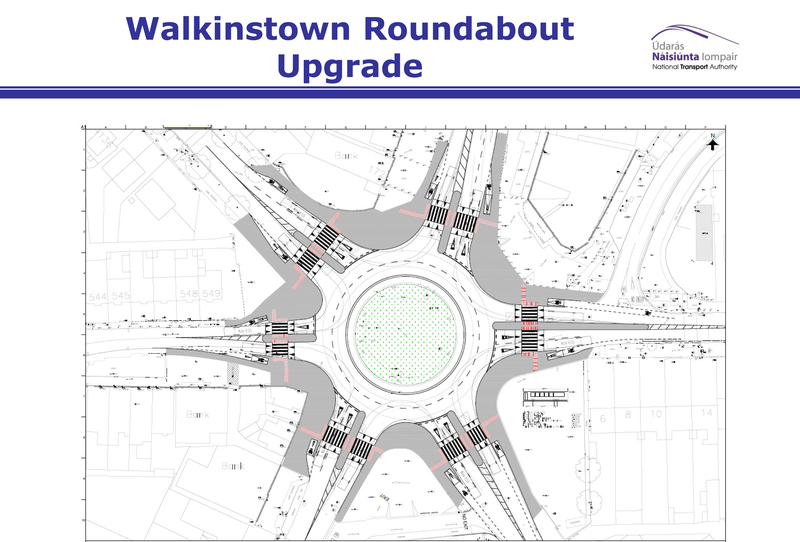 Last year more funding was then allocated for the “Trial re-configuration of the Walkinstown Roundabout, to make it safer, easier to use, more reliable and more attractive for all road users and for the locality” (figure to be confirmed), but local media have reported that councillors have complained of being ‘frozen out’ of roundabout talks on the design. The roundabout borders the areas of Dublin City Council and South Dublin County Council. We made it clear to the council’s press office that the Walkinstown roundabout will be central to our story. The council have already directed cyclists onto zebra crossings on at least two roundabouts in Lucan — the Griffeen Road and the Castle Road roundabouts, which are outlined as examples of the design on nationaltransport.ie. Separately, the NTA confirmed that they agree with the Department of Transport view that cyclists must dismount before using zebra crossings. But all of the questions we put to South Dublin County Council related to the council’s actions, questions which could not be answered by the NTA. We had asked South Dublin County Council why they used the design, and if they had consulted the Department of Transport or obtained independent legal advice. We also asked if the council included cyclists dismount signs, and, if not, “is guiding cyclists into zebra crossing without such signs misleading and promoting illegal use of zebra crossings?” The council did not reply directly to any of these questions. I went along the start of the Grand Canal last weekend, from GC basin to just before the M50. I wanted to see how easy it would be to get along with a cargo-bike. A little to the west of the Naas Rd and past Lock 3, there’s a stone marker to mark the opening of the Grand Canal greenroute. The reason I bring this up is because this is within South Dublin Co Co administration, just like the Walkinstown roundabout in the article above. And just to say that the barriers and gates all along there are utterly ridiculous. Impossible to get cargo-bikes, cargo trikes, bikes with trailers, mobility scooters, or wheelchairs past any of the gates and barriers. Even on a normal bike you have to dismount and manhandle it through the barriers. It’s a joke and makes a mockery of the idea of a greenway which should promote the free-flow of people. Who on earth signed off on the installation of these blockages?!? It seems that South Dublin Co Co has a history when it comes to ridiculous cycle infrastructure. There’s 6 roads on and off the roundabout, not 5. Any scheme to upgrade this should include access from Bunting Road. At the minute, there’s shared pedestrian/bike crossing on Cromwellsfort road to let cyclists get from Bunting road to the roundabout. I’ll stay cycling around the roundabout after and work I’d say. No, it won’t be legally mandatory for cyclists to use the shared footpaths and dismount at the crossings, but the cycle lanes will direct cyclists into the shared footpath. If you’re using the two lanes on the roundabout, you’d most likely leave the cycle lane and join the general traffic lane well in advance. I also use this roundabout as I live here on Cherryfield Road. What worries me is, narrowing the lanes down to two lanes, will be crazy! It’s bad enough as it is, with three lanes. The traffic at peak times is backed up down as far as the Ashleaf centre. The traffic is then up against the kerbs, us cyclists can’t move. There are cars, coming out from Bunting road, cutting right across the pedestrian lights, driving up onto the footpath, and you have to jump off the bike otherwise you’ll crash into the car. This is a mad idea. Surely SDCC can come up with a better plan! It looks like five of the six arms of the roundabout are twin-vehicle lane entries – as existing capacity. There are no large Cycle Logos marked in them so controlling the lane will not be expected or tolerated by some drivers for those riders who wish to maintain their legal vehicular approach and transit! Why is this junction not remodelled to a signalised junction like has been done recently for the Leopardstown/Sandyford junction at the Luas overbridge? Where is the road safety audit report for the design and does it specifically assess the safety and comfort of cyclists as well as sharing pedestrian crossings (Zebra type)? Trams: Have right of way over all traffic.